My three-year-old son is wearing the costume I made him. I was reading my son a bedtime story book titled, "Through the Starlight Window" and some of the words and images reminded me of my childhood watching the Disney movie "Pinocchio". I looked at numerous pictures of Pinocchio online and I imagined how I thought his outfit would look in real life. And so for the red overalls, I purchased a yard of red fabric and two wooden-like buttons. As my son slept, I would place the red fabric over his body and "guesstimate" or "eyeball" how much fabric I think I would need to make the red overalls. I also studied the construction of some of my son's pants and based on those and pictures of Pinocchio online, I drew and cut out patterns/shapes on the red fabric that I believe to make up the ensemble of the red overalls. After cutting out the patterns, I put them together via a combination of machine sewing and hand-stitching. At some point, I realized that it ended up having too low of a back and so I had to attach more fabric to raise the back portion. I then made buttonholes and sewed on the wooden-like buttons. To continue, with the main body of the overall finished, I added the designs on the sides using a gold ribbon trim that I separated from a gold rope-like upholstery trim. Next, with a sharp and pointy mini scissor, I poked holes on the side of the overalls, so I could push a turquoise blue ribbon through it to form four crosses on each side of the overalls. These side detailing was actually a last moment decision. It almost did not happen, because at that point, my fingers just had about enough of being poked by mini pointy scissors, needles and pins and so I thought I would just forgo that last detail. But I am glad I went through with it because I love the way it adds to the costume. Moving on to the yellow shirt, it was originally a long sleeve button-up collar dress shirt meant for a 12-month-old. And so in order to make it fit my three-year-old toddler again, I undid the seam on both sleeves and sewed it back up, but with very little seam allowance this time to make more room for the circumference of his arms. I also shortened and hemmed the sleeves so that it dropped just around my son's elbows. I made the white bib collar from some old clothes, too. I sewed the bib collar on top of the collar of the yellow shirt. In my first couple attempts, I was not satisfied with the size of the collar. It was not until about the third or fourth try to reshape it to a smaller size did I deem that the collar was proportional to the whole costume outfit. As to the black vest, it came with the yellow dress shirt. The yellow dress shirt and the black vest were part of an outfit ensemble that I purchased a while back. I had to reshape the vest so it did not look akin to those typical vest design that are worn normally, but instead it looked more similar to Pinocchio's vest which had more of a curved edge to it. I pretty much deconstructed the vest in order to reshape it. I removed the plaid-patterned faux napkin, as well as, the actual imitation pocket that the faux napkin was sewed in. I also removed the buttons and had the inside of the vest worn as the outside and vice versa. I then added the gold rope-like upholstery trim around the edges of the newly shaped vest. As for the blue bow-tie, I made it using a blue silk-satin fabric. And I made it in a similar fashion one would make a rectangular pillow case. Except I folded it in half to add more dimension and fluff to it. I then made the small center part of the bow-tie and slipped the main body of the bow-tie into it. Next, I attached a stretchy trim to it, so I can stretch it and place it over my son's head. I made sure it was a very, very loose attachment around my son's neck, so that the bow would not hang high up, but instead sort of hang a little lower, just as how the bow-tie appears on Pinocchio. If it were not for the white collar on the yellow shirt that helps to hide the stretchy trim, the stretchy trim would be visible and the blue bow would look akin to a necklace. And although I had fun making this costume, there was much frustration in the construction of Pinocchio's hat. It was my first attempt at making a hat and I tried my best effort to shape it to look as much as Pinocchio's. This part of the costume was very much time consuming. In fact, it took the longest time to make and the sewing machine needle actually ended up snapping in half in the process of making this hat. As for the materials, I used a yellow ochre colored cotton-type fabric as the main base and reinforced the hat with a thick and almost furry yellow ochre colored felt fabric. Basically, I used the felt fabric behind the cotton fabric to add stiffness as to hold the form/shape of the hat. Again, making the hat gave me the greatest frustration because the fabric was not very forgiving at all when it came to my amateur workmanship. There were so many instances that I really just wanted to give up on the hat and start over. But I then realized I do not have enough fabric to start over with, nor time, and so I was truly forced to keep re-working the hat. And with all the re-working and undoing of seams that occurred, I would say that effort paid off and I ended up with a fairly nice shaped hat that resembles Pinocchio's. But there was another challenged I faced. Sewing the blue silk-satin ribbon trim that went around the hat also proved difficult. I had to use whatever random little cuts of blue silk-satin fabric I had left over from the bow-tie and put them together into a semi-long strip of ribbon trim that formed a U-shape. It has to be a U-shape so it can be placed around the curved surface of the hat and look as evenly as possible. A simple straight ribbon trim would not have worked around the hat, for there would have been gaps between the main body of the hat and the ribbon trim, as well as, the ribbon trim would not have been in a parallel position in correspondence to the curvature of the hat. To finish off the hat, I added Pinocchio's signature red feather and underneath inside the rim of the hat, small attachments of sewing thread meant for bobby pins as to keep the hat from falling off my son's head. Since Pinocchio wears white gloves, I bought my son a pair of white gloves and I cut very thin strips of gray velcro to create those three stitch lines on top of each gloves. My son also wore these adorable brown loafer shoes that he already owned and they were perfect with the costume. And knowing that Pinocchio is a marionette puppet, I wanted to make the control bar and strings. I bought a long enough wooden bar and, in what seemed like forever to do, I cut it into pieces using a kitchen serrated knife, sanded the edges using a hand nail file/buffer, glued the bars together to form a cross and I let it dry. I then manually drilled four holes on the cross bar using a simple screwdriver that had a long, thin drill tip to it. Afterwards, I pushed through four black yarn strings on each hole with the aid of the mini pointy scissors. When my son wore the costume, I attached two of the strings very loosely to my son's wrists and tucked the strings underneath the gloves. I also attached the remaining two behind my son's loafer shoes. 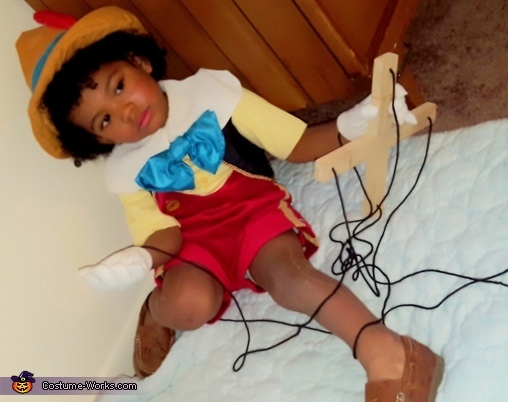 He can actually walk with the strings attached as long as he held part of the strings and the wooden control bar, but he kept playing with it to the point that it distracted him too much from interacting and playing with other children. And so I removed it for the latter half of our time at the mall where we enjoyed our Halloween. As I mentioned, we celebrated Halloween at the mall because it was terribly cold outside. There were many people dressed in costumes and a lot of people yelled out "Pinocchio" in awe as we walked around. People asked for a picture of my son with their kids, or even just to take a picture of just my son in his costume. There was one particular lady who came up to us (she said she was hesitant to do so at first, but mustered up the courage) and was emotionally happy, because she told me she loved all things "Disney" and that she used to work in Disneyland. She had nothing but praise for the costume and I think she had happy tears, too. She was so sweet! I ended up having numerous conversation with other random people at the mall and it was quite a pleasure. We talked about our costumes and when I brought up that I made the Pinocchio costume, they had nothing but compliments for me. One lady even told me that I should do this for a living (which is make costumes). I chuckled to myself and thought perhaps if my sewing skills improved, because my workmanship on this costume was sort of sloppy, but due to the forgiving fabric/material, one can't really tell from a distance.